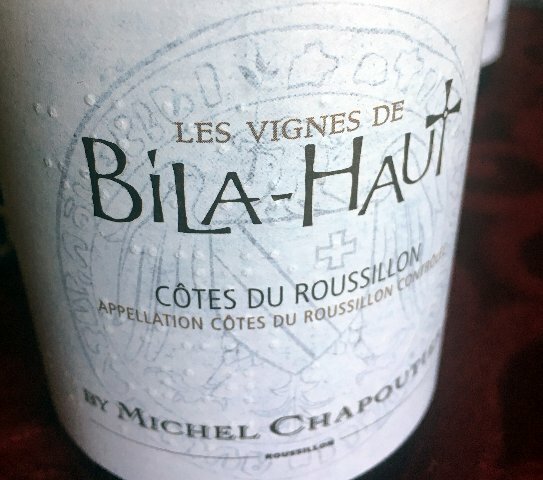 Each year anticipates a new vintage of Michael Chapoutier’s ‘Bila-Haut’ Cotes du Roussillon wines. I sampled the 2017 from Bila-Haut, located in the best part of the Languedoc called the Cotes du Roussillon. This special area was originally planted by Greek Mariners known for making top quality wines. The cross on the label signifies that there was once a house of refuge for the Knights Templar at the House of Bila where the estate is located. The hills contain 40+ year old vines that are managed for low yields with sustainable farming practices. The 2017 vintage equates to high quality fruit yield. Three varietals grow on the property of Bila-Haut, Syrah, for its strength, spice and aromas, Carignan for its minerality and crisp tannins, and Grenache for its bag of tricks. The other varietal used for the white wine is Macabeu, which is grown on another property owned by Chapoutier. The wines reflect the terroir that is influenced by the constant winds of the Midi. The grapes are hand harvested, then given full attention by the Chapoutier team. 2017 Bila-Haut Cotes du Roussillion (white) is a crowd pleasing wine. Its pale yellow hue and smoky citrus bouquet opens into a mouth full of pleasure. It is highlighted by a huge dose of fresh, crisp acidity with brine overtones. Made from a blend of Grenache Blanc, Grenache Gris and Macabeu, this vintage will please all levels of wine drinkers. 2017 Bila-Haut Cots du Roussillion Villages (red) is an interesting wine whose grapes, Syrah, Grenache and Carignan grow on the slopes of the schist laden, higher altitude, Agly Valley. In your glass the wine has a deep, dark, garnet hue. Strong aromas of dark cherries fill the glass, making way for a heavy beast of a wine that is well-structured and fleshy. The wine reminds me somewhat of a Sagrantino from Umbria. Its raw, warm and mimicks the schist’s heat of the terroir.